I remember summer in #Toronto. It was a golden time, warm with sunshine and a cold beer felt refreshing. Along the shores of Lake Ontario people frolicked along the boardwalks, bike paths and parks that run along much of Toronto's shoreline. 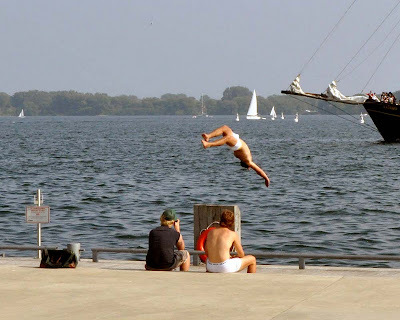 A group of friends join together at H2O Park at Queens Quay and one brave soul does a backflip into the harbour as a familiar tall ship in the background heads back to dock. I think the swimmers were in their tighty whities which is how most Torontonians swim in the water, or walk downtown for that matter. Toronto isn't know as T-Bone for nothing people!